The prices are the consensus prices between Amazon and B&H Photo and Adorama as of November 16 in 2015. These are new condition with USA warranty prices, from authorized dealers. All the prices are the body only kit prices. There are no mail-in rebates this time around. Older cameras that are no longer available in new condition with USA warranty from the above retailers are not included. The 2014 edition had three charts because the data required then. 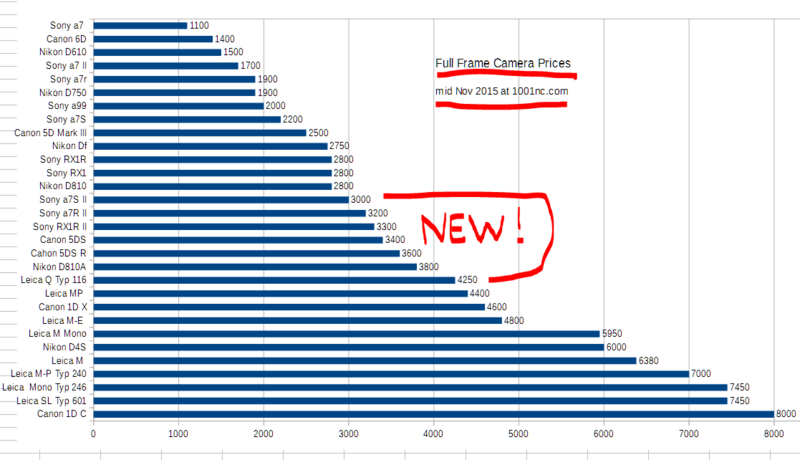 This year, as you can see in the chart below, we have a fascinating pattern emerge: Most of the new 35mm full frame cameras that were released in 2015 fit in the 2014 price gap between the Nikon D810 and the Leica M-E. Coincidence? I think not! Click on the picture or open in new tab/window to view it at a bigger size! Notice the big $2000 gap in the late December 2014 chart close-up below, between the Nikon D810 and the Leica MP. And now fast forward to November 2015, the $2000 gap has essentially disappeared, replaced by a staircase. Notice the cameras filling the gap, they are most of the new releases of 2015! Notice the NEW block above, framed by the Sony RX1, RX1R and Nikon D810 on one end and the Leicas on the other end. Very interesting indeed!